Right now, scientists know almost nothing about these mysterious crystals. They don't know how and when they form, what they look like or how they behave. 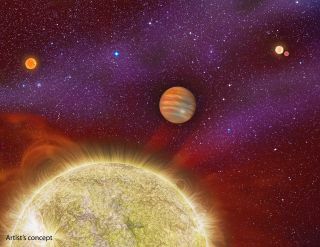 But the answers to those questions could have enormous implications for the surfaces of those worlds — whether they are covered either in flowing magma or ice, or are bombarded with radiation from their host stars. The answer, in turn, could affect the possibility of these planets harboring life. The problem with the scaling-up approach is you can't really understand how iron will behave at 10 times the pressure of Earth's core just by multiplying, she said. At those enormous pressures, the properties of chemicals fundamentally change. "We would expect to find crystals inside super-Earths that don't exist in Earth, or anywhere else in nature, for that matter," said Lars Stixrude, a theoretical mineral physicist at the University of California, Los Angeles, who has done basic theoretical work to calculate the properties of these extreme materials. "These would be unique arrangements of the atoms that only exist at very high pressure." These different arrangements happen, he told Live Science, because enormous pressures fundamentally change how atoms bind together. On Earth's surface and even deep inside our planet, atoms link up using only the electrons in their outer shells. But at super-Earth pressures, electrons closer to the atomic nucleus get involved and completely change the shapes and properties of materials. And those chemical properties could affect the behavior of whole planets. For example, scientists know that super-Earths trap a lot of heat. But they don't know how much — and the answer to that question has major implications for those planets' volcanoes and plate tectonics. At Earth's internal pressures, lighter elements get mixed in with the iron core, impacting the planet's magnetic field — but that might not happen at higher pressures. Even the physical size of super-Earths depends on the crystal structure of compounds in their cores. "It's really like a rocket ship effect," Duffy said.